Startwebsearch.com is the PUP that uses misleading techniques to prevent removal. Use Reimage to locate malicious components and get rid of them faster than with uninstall instructions. A full system scan blocks virus reappearance and prevents traffic to malicious domains. Startwebsearch.com looks like an ordinary search engine that allows customizing its appearance and make searching more convenient than ever before. However, research revealed that it’s just an empty promise. This program works as a browser hijacker that might take over Internet Explorer, Google Chrome, Firefox and other browsers. In the About page, authors of the Start Web Search claim that it delivers “search results from trusted search providers, ensuring you reliably find the information you’re looking for in an instant.” Currently, this tool redirects to Bing search results page. Indeed, Bing is a reliable search engine, but if you are willing to use it, you should make it your default search yourself. The Startwebsearch.com virus might affect targeted web browsers and alter their settings without asking user’s permission. It might happen when a person installs new programs incorrectly. Following successful infiltration, the hijacker might set its domain as default search engine, homepage or/and new tab URL address. According to the security experts, Startwebsearch.com might be capable of tracking information about users. Most likely it includes non-personally identifiable and browsing-related information. However, users are advised to uninstall this program immediately to avoid putting their privacy at risk. Startwebsearch.com removal is also recommended because the hijacker might make browsing the web unbearable by displaying tons of online ads and other commercial content. Users report that they were also redirected to unknown promotional websites. Undoubtedly, these activities are annoying and make browsing the web unbearable. To avoid an unexpected visit to the potentially dangerous website and protect sensitive information from unknown companies, you should scan the computer with Reimage. This anti-malware will help to remove Startwebsearch.com from the system safely. After incorrect freeware installation, Startwebsearch.com might hijack web browser and cause other annoying activities when browsing the web. The main page of the search engine does not provide a download link. Thus, users are not likely to find and use this search tool on their own. Indeed, developers rely on bundling – a deceptive software marketing method. This method allows spreading the PUP bundled with freeware and shareware as an “additional download.” When users install applications from the Internet under “Quick” setup, all optional applications are downloaded silently. Thus, Startwebsearch.com hijack usually becomes a surprise. to unmark pre-select additional programs. The hijacker was noticed actively spreading in the United Kingdom. However, users in other countries should be vigilant and avoid installation of the hijacker too. If you feel skilled enough, you can remove Startwebsearch.com manually. You have to uninstall browser hijacker and all its related components from the computer and each of the web browsers. Once these entries are wiped out, you have to reset Chrome, Firefox, Edge, Explorer or another browser you use. If you are willing to opt for an easier Startwebsearch.com removal option, you should choose professional security software. Install and update the program before running a full system scan. 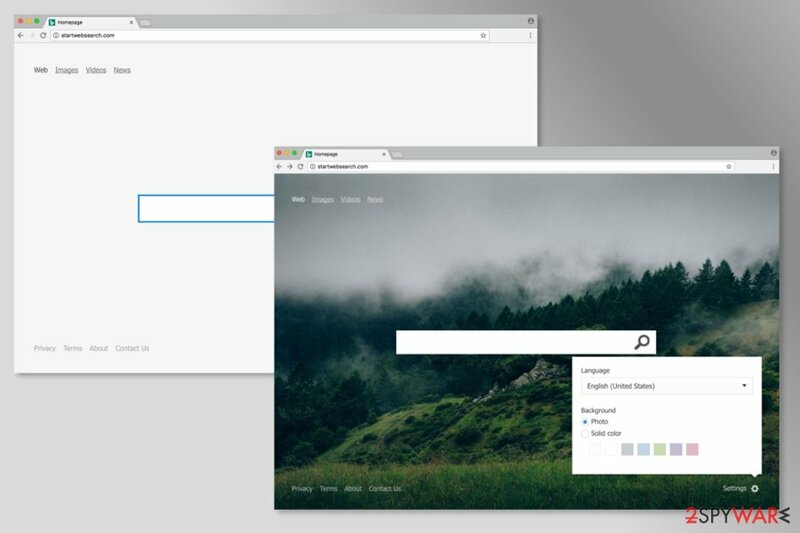 Within several minutes, you will be able to customize your browser. In order to remove the hijacker manually, you have to uninstall suspicious programs from the computer. If you cannot find any unknown programs, you should check the list of extensions of each browser. Here, look for Startwebsearch.com or any other recently installed suspicious programs. Wait until you see Applications folder and look for Startwebsearch.com or any other suspicious programs on it. Now right click on every of such entries and select Move to Trash. Once you uninstall unknown add-ons and reset Internet Explorer, the hijacker will be removed. When in the new window, check Delete personal settings and select Reset again to complete Startwebsearch.com removal. After the hijack, you have to recover Microsoft Edge. Below you will find detailed instructions how to do it. Once these steps are finished, Startwebsearch.com should be removed from your Microsoft Edge browser. So-called Startwebsearch.com virus may have installed various extensions to Mozilla Firefox. Thus, you have to uninstall them. Here, select Startwebsearch.com and other questionable plugins. Click Remove to delete these entries. Now you will see Reset Firefox to its default state message with Reset Firefox button. Click this button for several times and complete Startwebsearch.com removal. To get back access to Google Chrome, you have to uninstall browser extensions related to Startwebsearch.com and reset the browser. Here, select Startwebsearch.com and other malicious plugins and select trash icon to delete these entries. Click Reset to confirm this action and complete Startwebsearch.com removal. Here, select Extensions and look for Startwebsearch.com or other suspicious entries. Click on the Uninstall button to get rid each of them. Here, look at the Homepage field. If it was altered by Startwebsearch.com, remove unwanted link and enter the one that you want to use for your searches. Remember to include the "http://" before typing in the address of the page. Now you will see a detailed dialog window filled with reset options. All of those options are usually checked, but you can specify which of them you want to reset. Click the Reset button to complete Startwebsearch.com removal process. ^ Margaret Rouse. Sensitive information. TechTarget. Definitions By Topic and Technology News. ^ NoVirus. NoVirus. Latest security news and virus removal tutorials for British computer users. This entry was posted on 2017-07-18 at 04:32 and is filed under Stealing programs, Viruses. You can quickly scan the QR code with your mobile device and have Startwebsearch.com virus manual removal instructions right in your pocket. How did you remove Startwebsearch.com virus?